My Big Fat Gypsy Wedding isn’t the sort of thing I normally cover here at the TV Club. Usually, my type of fare involves gladiators, sorcerers, or a pigeon-training Mike Tyson. The type of gypsies I’ve dealt with in my pop culture past usually involve Stevie Nicks or Stephen King. Hearing early on that nearly 10 million people watched this show upon its initial airing in the U.K. sounds nice, but the voiceover lied: this first episode garnered slightly more than half of that in 2010. (Subsequent airings as a series earlier this calendar year did see a considerable rise in overall viewership.) Perhaps subsequent episodes flesh out some of the more provocative themes that emerge from this initial hour. But too much of this first foray substitutes cultural analysis for crass spectacle. Am I shocked? No. Am I disappointed? Given how much surprisingly interesting material emerges tonight, yes. Far too much of the hour spends time turning the heretofore unfilmed world of gypsies and Irish travelers into…well, fairly normal people with a flair for pomp turned up to 11. It’s all fine and dandy to see young Margaretha stumble through her first communion looking like a drunk, pink Dalek. Were this just an hour about “Gypsies: They’re just like us!”, then perhaps the way in which the documentary casually brings common stereotypes of travelers down to earth could have proven a point. That point? Fear of the unknown leads to unnecessary prejudice. That’s not exactly an earth-shattering message, but it’s hard to totally hate on a message of tolerance. But that’s not really what’s going on here. Or, at least, that’s not what’s really interesting about this first hour of what will be an ongoing series rebroadcast on TLC. What’s interesting is that the three stories selected for this hour frame the three points in a female traveler’s life that utterly and completely define, delineate, and ultimately limit their options in this world. Indeed, “options” hardly exist for Margaretha, bride-to-be Josie, and Josie’s younger cousins Montana and Cheyenne. To say that traveler’s life is patriarchal is accurate but doesn’t really get at the heart of what’s going on here. There are plenty of patriarchal societies in which women feel unnerved or disempowered. Here? The women understand the double standard, but don’t think there’s a damn thing wrong with it. In fact, it’s quite perfect as is. There’s something powerfully metaphorical about the way that the overly ornate dresses that help define the biggest days in Margaretha’s and Josie’s life bruise and cut them. These two girls suffer for the spectacle, with the other two girls in tonight’s hour caught between the bruises of the first and the impending pain of the second. The show draws a linear path from communion to wedding day as both constant and unyielding: Margaretha has barely finished her first communion before talk of her marriage comes about. With girls getting engaged at 14 and married by age 17, it seems an accepted and pervasive fact of life for women in this culture. The act of grabbing, first mentioned early in the hour and then seen in full display by episode’s end, highlights the dichotomy between the sexes. Upon first mention, “grabbing” doesn’t exactly sound pleasant, but doesn’t really have an air of danger about it, either. When we finally see it, it’s not horrifying specifically for the way in which the boy treats Cheyenne, although that’s highly unpleasant. Rather, it’s truly terrifying for the way 1) that Montana just lets it happen without intervening, and 2) Cheyenne justifies the entire encounter after the fact. For those interested in having a nature/nurture debate, you could have a field day exploring the way in which every single female in this documentary have bought the “it’s a man’s world” mantra hook, line, and sinker. The way in which men occasionally hurt girls during “grabbing” sessions links to the way those ornate dresses physically damage the girls that wear them. Unfortunately, an hour isn’t enough to do anything but point out this widespread view of the traveler world. It’s definitely interesting to see Josie’s fiancée Swanley get physically ill at the thought of being a stay-at-home dad, but there’s little context given for how this worldview got established. There’s no voice of dissention at all to challenge the status quo, either male or female. And most interestingly, there’s no attempt to truly examine where money in this culture comes from at all. Cheyenne continually buys expensive dresses that she wears once. Margaretha and her young siblings ride a limo while blearing dance music on the way to the communion. And Josie’s family of ten all travel to Spain to celebrate her impending marriage. The whole time I was watching this show, I felt like being a gypsy might be a viable vocational option given the current realities of the job market. Maybe such an examination of the traveler’s economic realities is beyond the point, but the fascinating mix of modern culture and ancient ritual that was only hinted at throughout the hour SHOULD be a focus going forth. Girls are expected to never be alone and continually call home to let their parents know where they are. At the same time, they wear clothes so skimpy that Britney Spears would tell them they were trying to hard. (Maybe travelers DON’T make a lot of money. Otherwise, they’d be able to afford the other half of these shirts.) The fascination with pomp and circumstance seem as much to do with royal/celebrity weddings as with their ancestry. The jarring mix of ethereal and material is intrinsic and ripe for analysis. 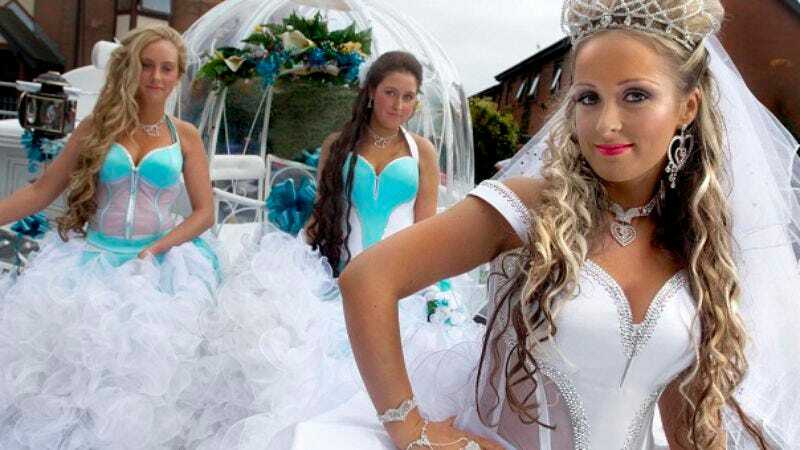 But My Big Fat Gypsy Wedding seems more inclined to spend valuable show time on late limos and dress mishaps than really delving into that dichotomy. Now, perhaps a series rather than a special could illuminate these things better. But I do worry that a series will focus on ever-increasingly outlandish dresses rather than the fascinating subculture that puts such a premium on them. Because as tonight’s episode showed: the real drama here isn’t inside the wedding reception, but just outside. That’s where the material really grabs you and shakes you out of your gawking stupor. I wonder if Thelma Madine puts “Wedding Dress Designer of Choice for Travelers” on her business cards. I was a bit thrown that Josie and her family lived in a house, not a trailer. The show just sort of breezed over that point, though I am sure they just rent on a monthly basis. Still, it’s another interesting tidbit that the show drove right by in order to show more bling. My wife, as Josie and Company emerged for their big night out in Spain: “THOSE AREN’T SPANISH OUTFITS!” I’ll just take her word for it. New rule: you can’t get married until you know who Audrey Hepburn is. Agreed? I want a spin off show with John Boy. That little kid is incredible. He’s like Manny from Modern Family meets Tim Gunn. Make the first communion suit WORK, John Boy. “She wants me to get violent.” Jesus Christ.